You can make the shopping cart of your Online Shop visible on all pages of your website. That way your visitors can go to checkout from any page on your site. 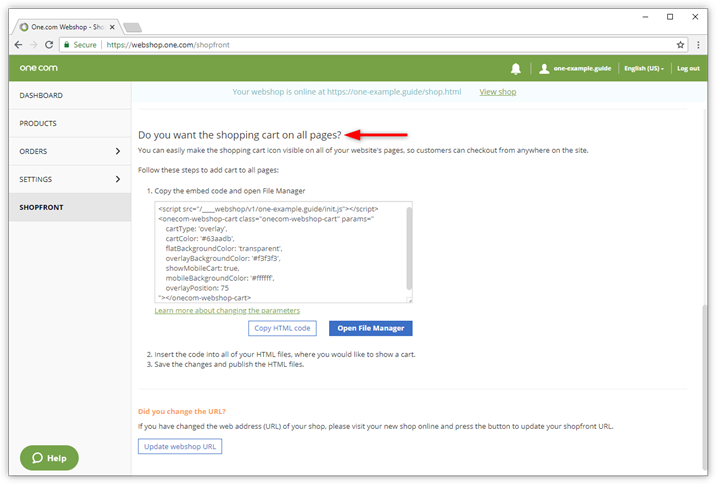 In this guide, we explain how to embed the shopping cart to your Website Builder site, but you can also paste it into other HTML pages using File Manager or FTP. Open your Online Shop administration, from the One.com control panel. Scroll down to "Do you want the shopping cart on all pages?". Adjust the parameters to your preference and click Copy HTML code. Go to template mode and drag the Code component into your workspace. Paste the code into the Code component. Set placement to normal or before the closing of the body tag. Tip: By changing the HTML parameters, you can determine the colour, background and placement of the cart on your site. Read our guide to learn what each parameter does: HTML parameters to show the Online Shopcart. What are HEX and RGBA colour codes?